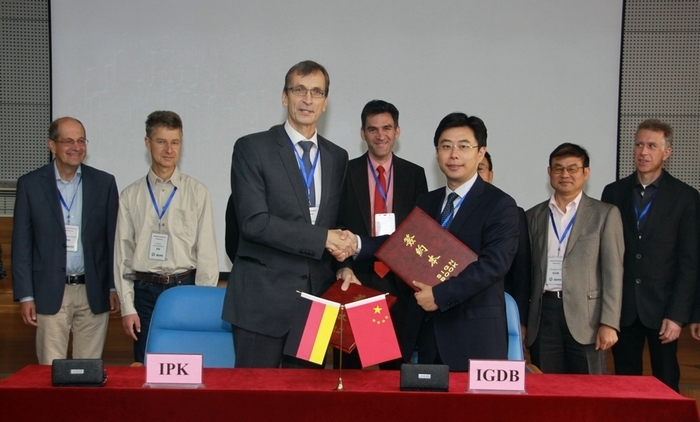 A signing ceremony of the Memorandum of Scientific Cooperation between the Leibniz Institute of Plant Genetics and Crop Plant Research (IPK), Germany, and the Institute of Genetics and Developmental Biology (IGDB), Chinese Academy of Sciences, China, was held during the IGDB-IPK Bilateral Workshop on Plant Biology, which was held from October 20 - 21 in Beijing, China. Dr. Andreas Graner, the Managing Director of IPK, and Dr. XU Weihua, Deputy Director of IGDB, signed the Memorandum on behalf of the two parties, respectively. The memorandum specified the mechanism of cooperation and the fields in which the two parties shall collaborate, and laid the foundation for further substantive cooperation. Signing of the memorandum will enhance the exchange of scientific experience and knowledge among scientists of the both parties, and promote the development of collaborated research projects. The Leibniz Institute of Plant Genetics and Crop Plant Research (IPK) is a nonprofit research institution and a member of the Gottfried Wilhelm Leibniz Association in Germany. The Institute is an internationally renowned plant research center, and is working on the problems of modern biology in fundamental and applied research by focusing on cultivated plants. The central concern of the research at the IPK is to study the genetic diversity of wild and cultivated plants with the aim to make the scientific findings, methods and plant material available for more effective and expanded use of plants in the agricultural sector, but also to be a supplier of new and improved biomaterials especially for pharmacy. The institute draws its strength from the use of the enormous biological diversity preserved, analyzed and used in its world-famous crop Bank, in which about 151,000 different cultivars, land races and crop wild relatives from the temperate region have been collected and stored. The IPK works on research fields that contribute to a deeper understanding of the molecular genetic and physiological bases of plant characteristic value and plant performance. Primary focus of the institute is research into crop plant species such as barley, wheat, maize, rapeseed and potato. In addition, fundamental questions of plant evolution, domestication, and the molecular underpinnings of plant traits are investigated in model plants. Research in IPK is clustered around following three topics: conservation, development and utilization of plant genetic resources, plant genome dynamics and integrative biology of plant performance.